During the first ten days of September, Hawai‘i hosted the International Union for the Conservation of Nature (IUCN) World Conservation Congress. 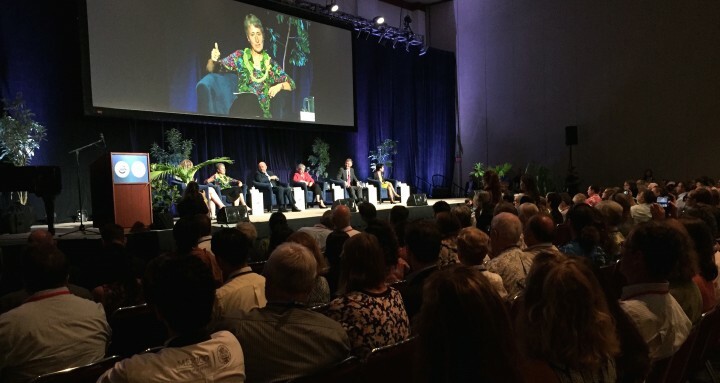 Over 10,000 representatives from environmental non-profit organizations, government agencies, private businesses, and academic institutions convened in Honolulu. President Barack Obama used the opportunity to speak on the topic of climate change to Pacific Island leaders and IUCN representatives. His administration announced new policies to promote conservation and build climate change resilience in the Pacific. The World Conservation Congress and President Obama put a global spotlight on the biocultural diversity of Hawai‘i, and the acute threat of climate change to Pacific Island States. Here in Hawai‘i, focusing on the ‘āina is the day-in, day-out work of natural and cultural resource practitioners. What is being called for by international leaders is already being worked towards by local practitioners as they strive to protect species like the ʻIʻiwi bird and ʻŌhiʻa tree that are endemic to Hawai‘i and integral to our biocultural heritage. These and other species are endangered by a changing climate, which will shift the suitable habitat ranges of species as temperatures and weather patterns change. Species that currently live in areas under protection may need to migrate to areas that are not protected. As temperatures warm, pests and pathogens – like non-native mosquitos and avian malaria – will spread to higher elevations, threatening native Hawaiian bird refuges. Sally Jewell, the United States Secretary of the Interior, speaks on a panel during the IUCN World Conservation Congress in Honolulu.Sally Jewell, the United States Secretary of the Interior, speaks on a panel during the IUCN World Conservation Congress in Honolulu. Local resource managers discuss different combinations of climate drivers and consider the planning implications for Maui, Lānaʻi, and Kaho‘olawe. Preparing the Hawaiian Islands for global climate change requires collaboration across sectors and agencies. 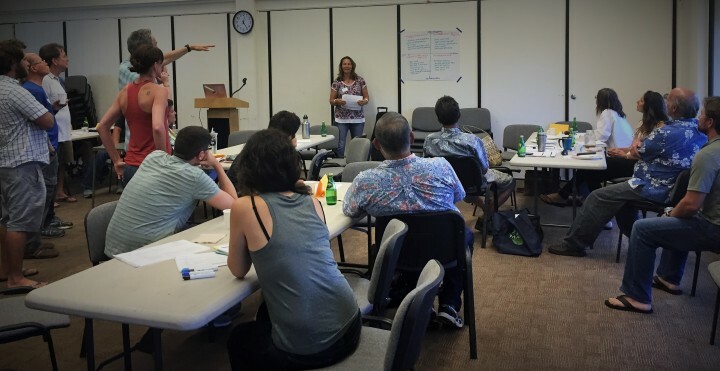 This is why over two dozen local natural and cultural resource managers from various government agencies and NGOs convened in Kahului on August 16-17, 2016 to discuss biodiversity conservation and climate change in the local context: focusing on Maui, Lānaʻi, and Kaho‘olawe. The island of Kaho‘olawe, with Maui in the background. The Kaho‘olawe Island Reserve Commission was one of the local organizations and government agencies involved in the Hawaiian Islands climate synthesis workshop for Maui, Lana‘i, and Kaho‘olawe in August 2016. Over the course of two days, Maui Nui’s natural resource specialists worked together to do vulnerability assessments of local habitats and scenario planning for different climate drivers. 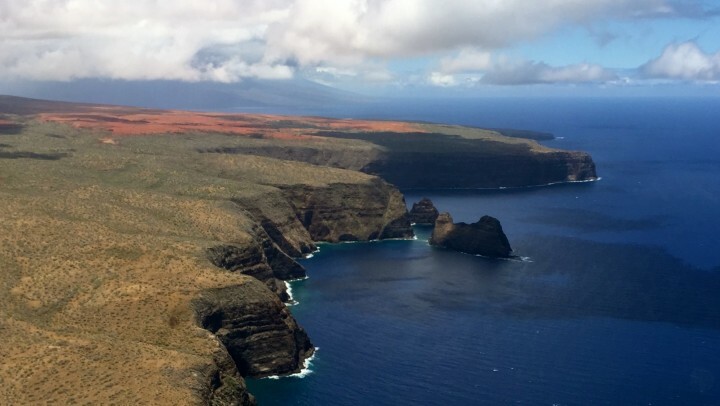 This is the first of a series of climate synthesis workshops focused on the specific vulnerabilities of individual Hawaiian islands to climate change. These workshops are part of the Hawaiian Islands Climate Synthesis Project funded by the Pacific Islands Climate Change Cooperative (PICCC), as part of the larger Hawaiian Islands Terrestrial Adaptation Initiative (HITAI). The PICCC is working with EcoAdapt to develop comprehensive, science-based syntheses of climate change projections and the anticipated impacts on terrestrial and freshwater resources within each of the main Hawaiian Islands, followed by the development of adaptation options for these habitats and resources. The ultimate goal of this work is to support the integration of climate change research and information into resource management and decision-making in Hawai‘i, and plan forward so that our islands will be more resilient to environmental changes in the future. Groups comprised of local environmental and bio-cultural experts from government agencies, non-profit organizations, academia, and a private ranch worked together on climate vulnerability assessments for Maui, Lana‘i, and Kaho‘olawe. A combination of local expertise and the best available climate science inform the Hawaiian Islands Climate Synthesis Project. Future workshops will be held in Moloka‘i, Kaua‘i, Oah‘u, and Hawai‘i in late 2016, and a second round of island-specific climate synthesis workshops will be held in 2017. If your work involves environmental and bio-cultural management in Hawai‘i and you would like to contribute your expertise to the Hawaiian Islands Climate Synthesis Project on your island, you can contact the PICCC Adaptation Initiatives Project Manager, Dr. Wendy Miles, at wendy.miles@piccc.net. Our 2016-2017 workshops will involve identifying the best available climate science and critical informational gaps for Hawai‘i; gathering information from local experts on the climate-related vulnerabilities of the main Hawaiian Islands’ habitats; and working together to create adaptation options to reduce these vulnerabilities.